We will be looking at some of these instructions in the Omron CP1H PLC. Examples of the instructions will be presented. 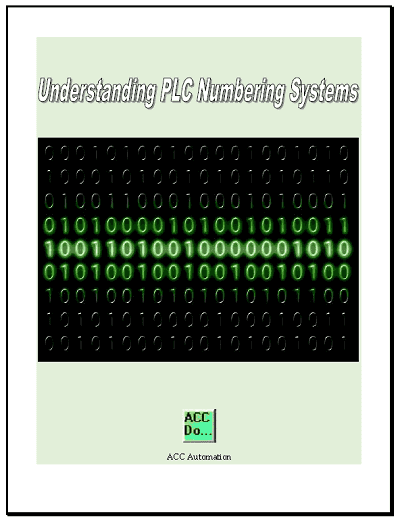 SCL(194) when used will be scanned and executed every cycle of the PLC that the input condition is on. @ SCL(194) when used will be executed when the input condition turns from off to on. This will trigger the instruction to happen only once. Please refer to the programming manual or help file in CX-Programmer for different variations of the instructions that you want to use. We will now go over some of the data control instructions in the Omron CP1H. This will give you a general idea of the instructions available. This list gives you all of the data control instructions in the CP1H. Allot of these instruction will only work with equipment wired into the controller to see the functionality. We will be looking at some of these instructions. An explanation will be given to the instructions that need additional equipment to properly demonstrate. The first two instructions will deal with PID control. 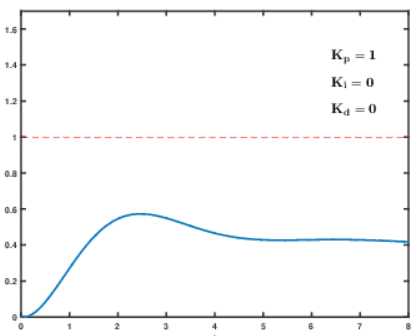 PID Control will calculate an error e(t) as the difference between the set point (r(t)) and a measured process variable (y(t)). 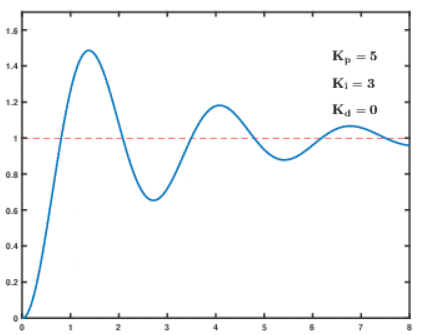 It applies a correction factor based on proportional, integral and derivative terms. 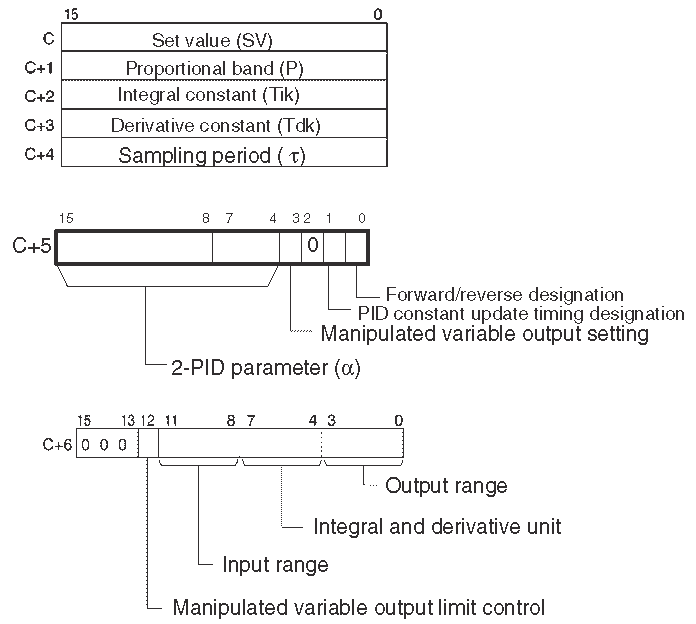 A PID control algorithm is based upon time. It controls the output in order to reach the set point without overshooting or undershooting the system. The following link will show you the effect of P, I and D separately on the control system. The input is read and based upon the parameters that are set, the manipulated value is outputted. If the settings are set within the permissible range, PID will be executed. This instruction will not perform a ‘bumpless’ transfer. 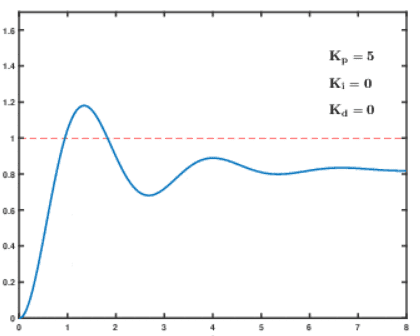 A bumpless transfer is an output that gradually and continuously changes the manipulated variable to avoid sudden changes. Complete instruction information can be obtained in the instruction manual for the controller. 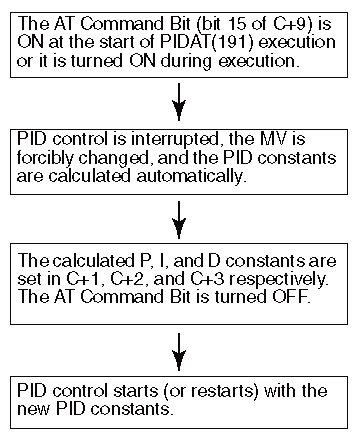 This instruction will execute the PID similar to the above instruction, however the PID constants can be autotuned. This means that when autotuning is activated, the feedback from two cycles of the control (Above and Below Set Value (SV)) will be used to set the PID. 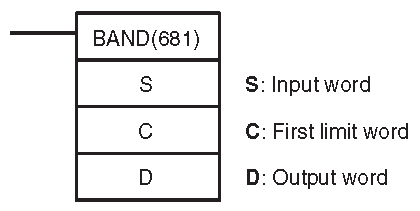 Parameters must be set in the controller (Binary) for the instruction to operate. Here is the control diagram for the instruction. 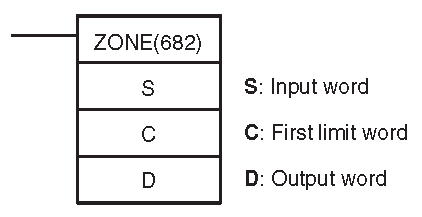 The autotune of the instruction has the following logic sequence. 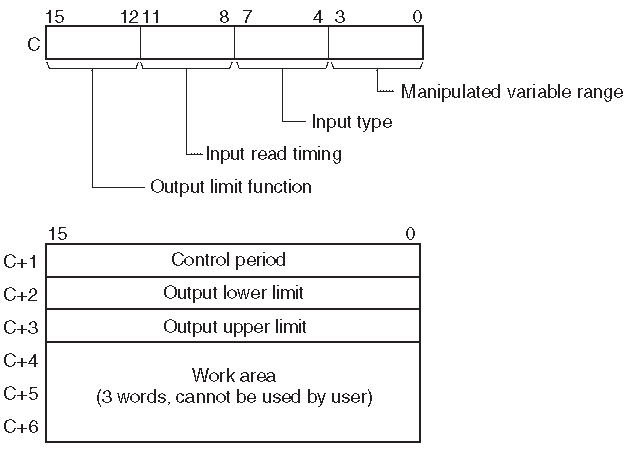 This instruction will control the output data according to whether or not the input data is within upper and lower limits. 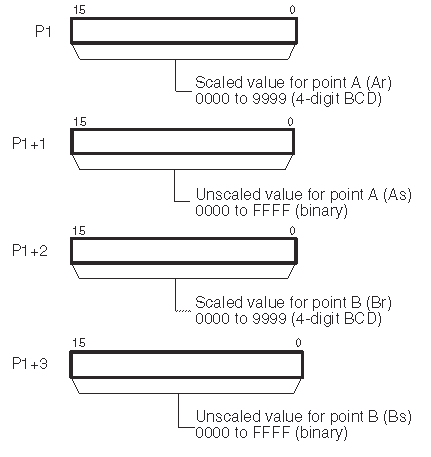 The limits are set in the first two registers specified. 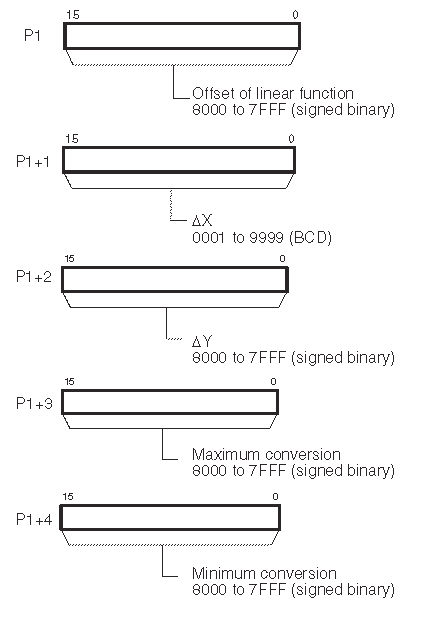 They are in binary format. The following flags will be available in your program after the execution of this instruction. In our example the input is within the limits so the value is passed to the output. If the input is higher than the high limit, the high limit is passed to the output. 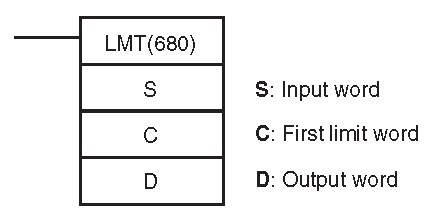 If the input is lower than the low limit, the low limit is passed to the output. Flags are set as indicated above for each condition. We specify the lower and upper limit words for this instruction. 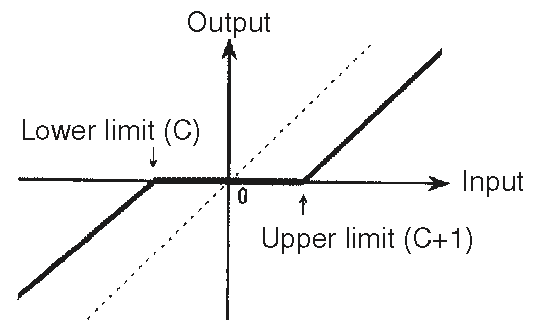 In our example when the input is within the upper and lower limits the output will be zero. When it is outside of these limits the output will show the amount that it is out. Adds the specified positive and negative bias to the input data and outputs the result. If the input is positive, the positive bias is added to the output. 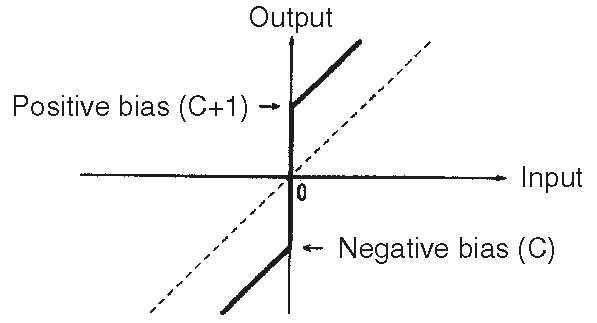 If the input is negative then the negative bias is added to the output. 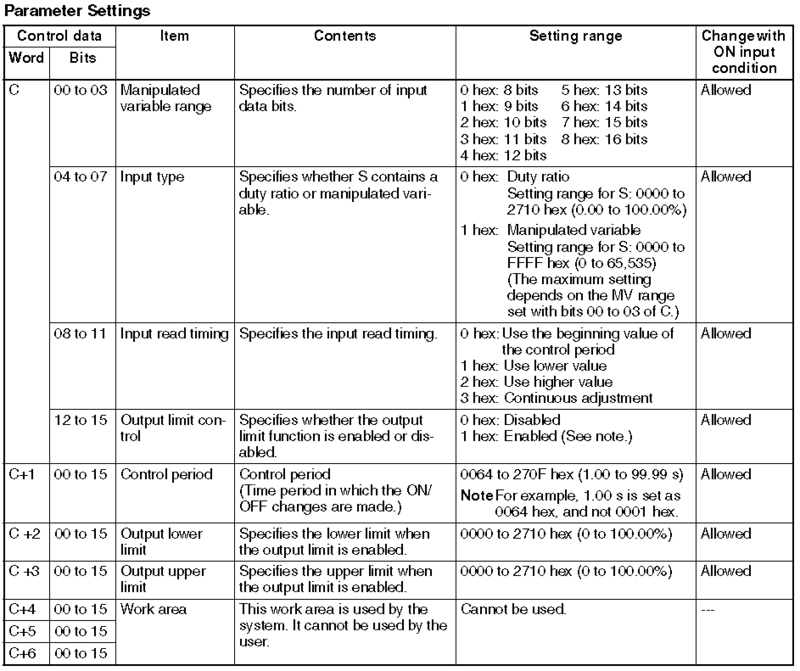 Flags are associated to this instruction as per the following table. This instruction will take the input as either a duty ratio or manipulated variable (PID output) from the specified word, converts the duty ratio to a time-proportional output based on the specified parameters. This is then sent to the specified output bit. 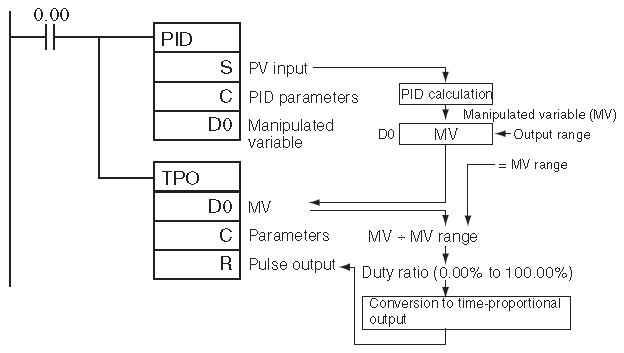 Most time this is used in conjunction with the PID instruction as per the following diagram. In our example we are just using the instruction as a duty ratio on the output. The following chart explains the parameter settings. 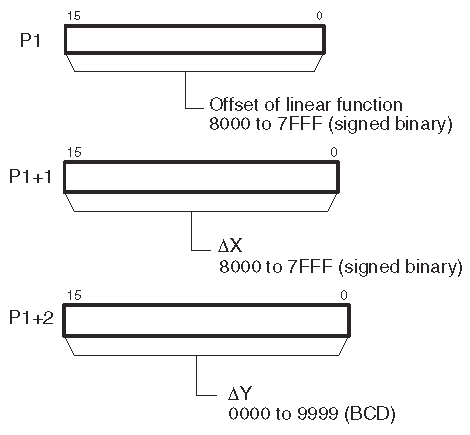 This instruction will convert an unsigned binary data into unsigned BCD data accoutring to the specified linear function. 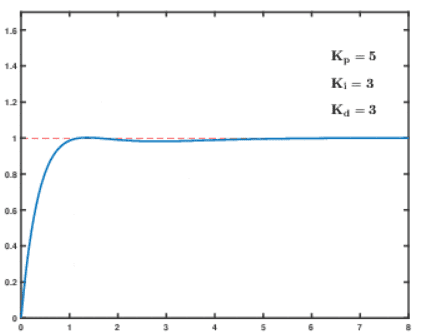 The parameters specify the linear line. 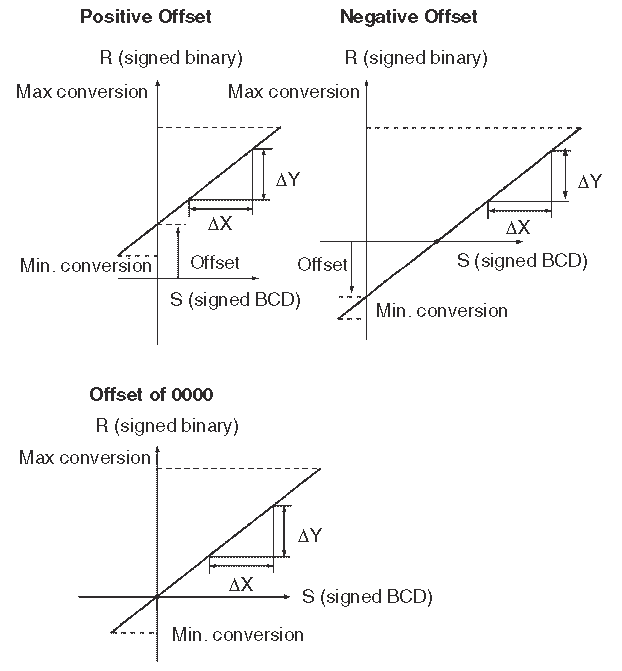 The instruction will convert a signed binary data into BCD data according to the specified linear function. 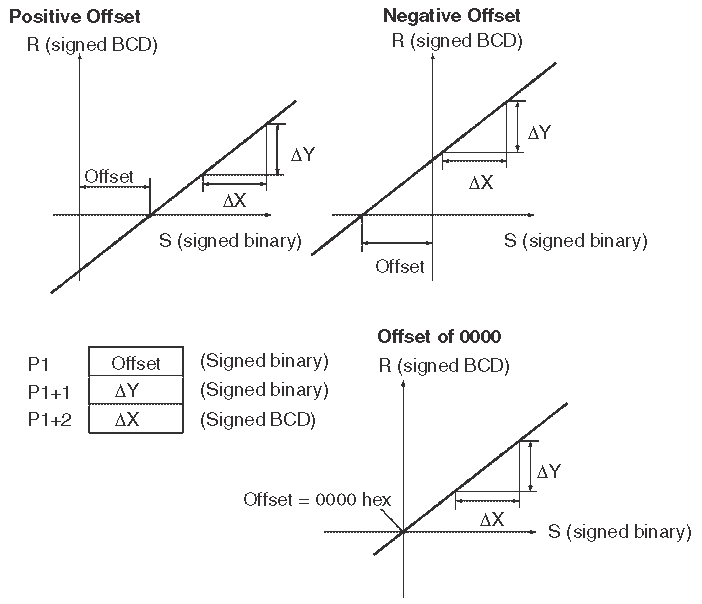 An offset can be also defined in the linear function. The slope of the line is Delta Y / Delta X. 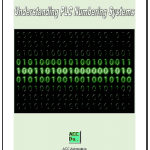 This will convert a signed BCD number into a signed binary number according to the specified linear function. 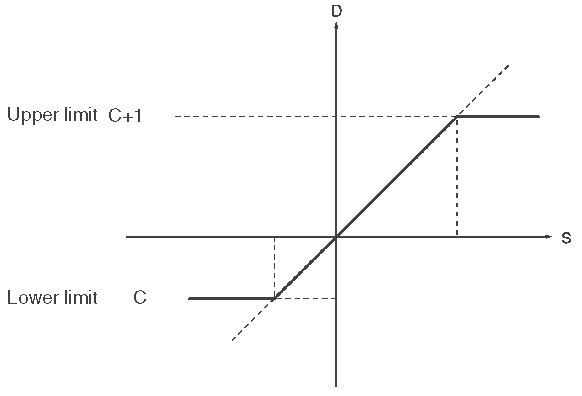 An offset can be defined in the linear function. 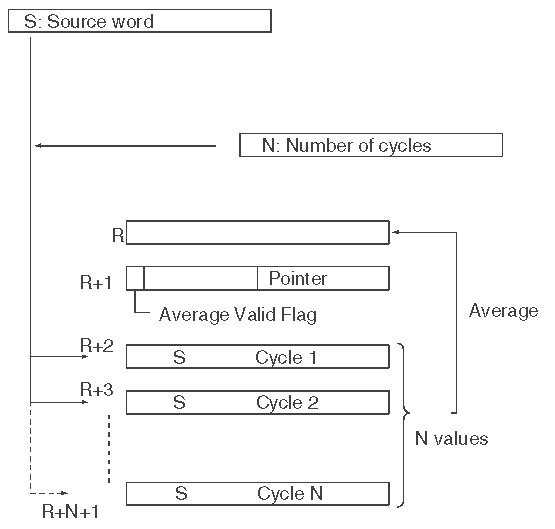 This instruction will calculate the average value of an input word for the number of cycles specified. It can help with stabilizing an analog signal. You can see that we have many different data control instructions in the Omron CP1H. This should give you a good idea of what is possible. 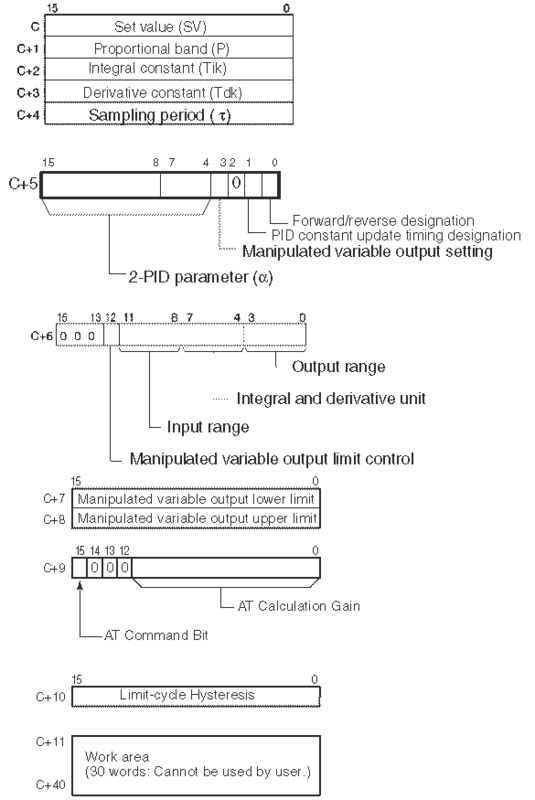 See the YouTube video below on data control instructions in the Omron CP1H PLC. Next time we will look at AdvancedHMI Communication to the Omron CP1H PLC.